Descending 100ft. for every 800ft. forward would be an average glide-slope for an Intermediate hang-glider: 1 in 8. This best glide-angle is where the wing is flying most efficiently, losing the least height for maximum forward distance. This speed is called "Max Glide". If flown faster or slower the slope will steepen. A little slower, another special speed, is where the glider's descent rate is at a minimum, the speed of best lift, known as "Min Sink". Here descending 100ft. may only carry you 600ft forward, a glide-angle of 1 in 6, but it would take longer. Max-glide and Min-sink are the two main performance characteristics of any glider. This forward speed down the glide-angle, is felt by the pilot as a breeze on the face and ears, like when riding a bicycle downhill. This is your airspeed. Unlike the bicycle, the slope is created by the shape of the wings and the pilot's weight, but you feel the airflow coming up your glide-path. You can see the slope as the wing creates it, and the pilot alters it by weight-shift. Pitch refers to nose-up or nose-down. Roll, to rotation about the keel as an axis. Yaw, nose-left or nose right, or, rotating about a vertcal axis. Weight-shift control can alter pitch and roll, yaw is dependant on the airflow. The pilot controls the pitch and roll by weight-shift. Moving his weight forward pitches the nose down, moving to the right makes the glider roll to the right, and vice-versa. Hang-gliders have two-axis contol only, yaw being completely dependant on the roll. When the glider rolls, it begins to sideslip so the airflow from the side makes the glider yaw and therefore turn. Ironically, the more yaw stability built into a hang-glider, the better it will turn. Most people are familiar with the concept of the centre of gravity as the point through which all the weight of an object can be thought to act. The centre of pressure, or centre of lift, is a similar concept. The point through which the sum of the lift can be thought to act. Considering these two points on the hang-glider we can understand much of how the glider flies. The C of G is altered by the pilot moving his weight in relation to the rest of the wing. The C of P changes with the airspeed. In a stable glide the Cof G will be directly below the C of P. Now, if the pilot swings his weight forward, thus altering the C of G towards the nose, there will be a turning moment pitching the glider nose down. With an increased slope the glider picks up speed, and as the speed increases the C of P moves forward until it is again above the C of G reaching a new faster stable glide position. When the pilot moves the C of G to one side the glider will roll towards that side, thus initiating a turn. Yaw stability is provided by the nose-angle, the sweep-back of the wings, and any vertical surface behind the C of G such as a keel pocket or a fin. If the glider begins to yaw, the drag increases behind the C of G and thereby returns the wing to the nose straight position. Like a weather-vane the glider in flight always points the nose into the airflow. When the glider rolls, it creates a slope to that side and so begins to side-slip. The incident airflow, now slightly from the side, causes the glider to yaw. The inherent yaw stability of the nose angle links together roll and yaw, making yaw completely dependant upon roll.. Pitch stability comes from a twist or "washout" in the swept-back wing, and from the curve upwards on the trailing-edge called reflex. If the nose pitches down a little then the glider will pick up speed. More speed will reduce the angle-of attack and because of the twist, less lift will be produced at the wing-tips, so the C of P will track forwards in front of the C of G, lifting the nose again. Hang-glider's have flexible wings which will change shape as the angle-of-attack changes. Wing tip-struts and "sprogs" ensure that the washout remains at higher speeds by stopping the wing-tips deflating further than a fixed amount. Beyond this speed the wing-tips will begin to have a negative angle of attack thereby producing negative lift behind the C of G, putting the nose back up. Luff-lines from the king-post perform a similar function by retaining a minimum amount of reflex on the trailing-edge. At faster speed more reflex is held into the sail, therefore negative lift behind the C of G again pushes the nose up. Pitch control is convergent around the trim-speed set by the pilot's hang-position on the keel. If the pilot pulls his weight forwards or back an increasing pressure is felt back towards the set neutral "trim" speed. Roll stability is a combination of two factors. Most apparent is the pendular stability of the pilot hanging below the wing. Lowering the pilot by lenghtening the hang-strap, will increase roll stability, and vice-versa. Not as apparent but equally important is what's called dihedral built into the wing. (If you stretch out your arms and pretend they're wings, and now raise your arms a little you have more dihedral, if you lower them, less) On the hang-glider this is set by the length of the side wires, or by the length of the base-bar. Increasing either will angle the wings higher and thus achieve more roll stability through increased dihedral. There is a trade-off between stability and performance. Increased stability will reduce performance. In a stable glide the "lift" balances the weight in the opposite direction to gravity. We can divide this total lift into two forces at 90 degrees to each other. The "aerodynamic" lift is the force acting perpendicular to the glide slope. Drag is the air-resistance to sliding forward, acting against the direction of glide. The lift/drag ratio is equivalent to the glide angle. There are two types of drag. As the glider flies, some of the airflow under the wing escapes around the wing-tips forming spiral vortices trailing off behind. Vortices are also created along the trailing edge of the sail. In creating these eddies the wing loses energy in the form of "induced drag". 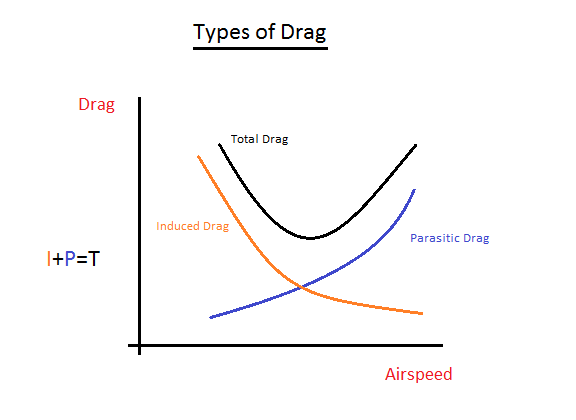 This type of drag is highest at low speed, reducing as airspeed increases. What we are more used to considering as drag, is called "profile" drag, which increases as the square of the speed, low at low speed and high at high speed. So the total drag is the sum of these two components. Plotting total drag against airspeed gives a "U-shape" curve, the bottom of which corresponds to the most efficient flying speed (the best glide angle). After the 2nd Generation of hang-glider design, curves were built into the sail to allow a smooth airflow over the wing. This laminar airflow greatly improved the L/D ratio. A single surface aerofoil is the right shape only for one particular airspeed. When the glider is flown faster or slower the incident airflow will no longer fit the shape, causing extra drag. With the "4th generation" an under surface was introduced by extending the leading-edge pocket to form an aerofoil suitable for a range a speeds. On the "5th Gen" gliders the space between the top and bottom surface is extended to enclose the cross-tubes, thus removing them from the airflow. This significant reduction of profile drag increases the L/D ratio. (Glide-angle). Most texts on aerodynamics start with a picture of the aerofoil section, with it's double surface, and describe "Bernouille's theorum" to explain how aircraft fly. The theorum states that, in adjacent airflows, the faster will have a lower pressure. The airflow over the wing has further to travel than that below and has to spread out further and speed up. This results in a reduced pressure over the wing compared to underneath. Modern theory no longer includes Bernouille, a positive angle of attack and laminar airflow are sufficient to explain the differences in air pressure above and below the wing. All hang-gliders have a minimum flying speed, this is usually between 10 and 15mph. The reason for this minimum speed is that below this speed the angle of attack is so great that the airflow can no longer follow the shape of the upper surface but breaks up forming turbulence over the wing. Lift is dramatically lost over the wing, the C of P snatches back and the nose of the glider pitches down. This is the stall. The glider will stall if the pilot flies too slow or when a varying wind, (a gust), causes the a.o.a to become too high. The characteristic swoop of the stall may take 50 or 60 feet, two or tree seconds, before the pilot regains control. To prevent such loss of control extra speed is maintained when flying near the ground. As the glider approaches the stall, the decreasing airspeed is felt and heard. Roll control becomes more difficult and hard to initiate. The glider is easily upset by extra lift under one wing or the other and so it's hard to fly in a straight line. The reason for the loss of control is that when flying slow the air is passing slowly under and over the wing and so takes longer to escape (when flying fast the air under and over the wing is replaced quickly and so it's easier to control). On hang gliders the best lift speed is very close to the stall speed so great care must be taken when trying to gain height near the ground, i.e. when attempting a soaring flight in weak lift. Maximum speed on the hang-glider is acheived by the weight pulled furthest forward with the pilot's weight through the control frame towards the nose. Theoretically a vertical dive at zero angle of attack would give the greatest speed however no hang-glider can maintain a vertical dive because of the built-in stability provided by fixed reflex and washout. So the fastest speed is when the pilot's forward weight is balanced by the sail touching the tip-struts or tight luff-lines. Modern hang-gliders have a speed range of 15 to 70 mph. At each speed there will be a particular sink rate, (vertical speed), therefore, a glide angle. The polar curve is a graph which plots horizontal speed against vertical speed for a particular glider. As the pilot alters the forward speed, the descent rate, (the vertical speed), will change. So the polar curve describes a particular glider's complete glide performance. The graph is usually plotted with the forward speed on the x-axis, and the vertical speed on the y-axis. As the vertical speed is downward we use the negative side to the y-axis. A higher performance glider will have a flatter curve. Just above the stall speed is the slowest stable speed so this is the first point on the graph. The top of the curve is the minimum sink speed, the speed of best lift. A tangent to the curve drawn from the origin will touch the curve at another interesting speed, the maximum glide speed. Here the glider is flying at it's most efficient, going further for the least loss of height. Notice that this will be some 5 to 10mph faster than the min sink speed. When searching for lift the max glide speed will cover the most distance for the minimum height loss. When in lift, min sink speed will gain height quickest. Other interesting details can be revealed by manipulating the polar curve. The best speed to fly will depend upon whether we fly, into or with, the wind direction, and on rising or sinking air. We can shift the origin of the polar curve to read off the glide performance, relative to the ground. Modern flight instruments have the facility to program in your glider's polar curve, and will indicate the best speed to fly under changing air conditions.